The Victorian Peeper: Great Expectations or Hard Times Ahead? Great Expectations or Hard Times Ahead? "Great Expectations for Dickens Theme Park"
CHATHAM (Reuters), 12 April 2007 - Literary purists may quake at the prospect of a Charles Dickens theme park complete with a Great Expectations boat ride and Ye Olde Curiosity Gift Shop. But Dickens World, a £62 million ($115 million) complex built in the naval dockyard where his father once worked as a clerk, is confidently predicting 300,000 visitors a year to this new attraction dedicated to the Victorian author. "We are not Disney-fying Dickens,'' insists manager Ross Hutchins as he dons hard hat and fluorescent jacket to tour the site, a hive of activity as the Fagin's den playground and Newgate Prison's grimy walls are given their finishing touches. "If Dickens was alive today, he would probably have built the place himself," Hutchins said of the theme park in Chatham, once a big unemployment blackspot in southeast England after the dockyards closed in the 1980s but now a major regeneration target. "In fact, if Dickens was alive today, he would probably have been working for television as a scriptwriter. He was very much a populist,'' he said of the author of classic tales like Oliver Twist. Some critics may have been scornful of the project in the lead-up to its opening on April 20. But Hutchins insists the attraction -- a dark, dirty, and dank London is populated by thieves, murderers, and ghosts -- has the air of authenticity as it was built in consultation with experts from the Dickens Fellowship. 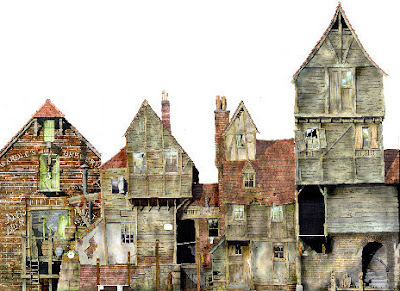 "Is the world ready for a Dickens theme park?'' The Observer newspaper asked of the giant indoor attraction. He talks with crusading zeal about the project, proudly showing off the interactive screens in the mock schoolroom or checking the boat ride that takes visitors from "the sewers to the rooftops of London.'' But he is the first to recognize Dickens still has a lot of catching up to do with Shakespeare in literary popularity. "If you asked many people today under 30 to name five Dickens novels, they probably couldn't. We are going to bring Dickens to life,'' he promised. There was certainly no shortage of job applicants with 950 people chasing up to 60 jobs in the theme park.